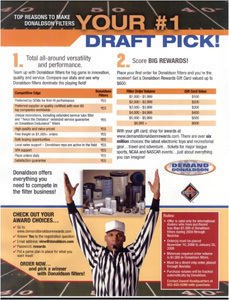 The Donaldson Program is a great example of an online points program where winners can select merchandise, travel and entertainment rewards. Have your past incentive programs been a disappointment to both you and your salespeople? The dangling of the proverbial carrot is an ancient art that is commonly understood to be at the heart of human behavior, psychology, motivation, and, in particular, business. Manufacturers and distributors commonly use this technique with their channel partners in an effort to add unique motivational value to move specific products or services. The reason this technique has stood the test of time is because, for the most part, it works! At times, however, elements of the technique are executed improperly. Sales incentive programs under perform or fail as a result. The monetary values of incentives are often not the critical factor in motivating salespeople to succeed. Take my own example. I was fortunate to work in an industry that provided an unending supply of incentives and awards for overachievement. I knew that, if I won every trip, every TV, every incentive offered, the money would come with it! For me, the money and the goodies were not my primary motivation. My philosophy was simple; "If you win all the incentives there are to win, you couldn't help but be at or near the top every time." Corporations use incentive programs to drive behavior and I agreed to play the game and conform to their wishes; what gets rewarded, gets done. 1) The 80-20 Rule: Twenty percent of the salespeople make eighty percent of the sales and profits. Too often, sales incentives – perhaps in an effort to be fair – are geared to the entire sales force or VAR channel. The risk in a program like this is that the glove that fits everyone, in the end, fits no one. Enlightened marketing strategists know that the top twenty percent are already motivated. Simply put, a strategy that's geared to light a fire under the next twenty percent – the next logical group – doubles the business in a more cost efficient manner. 2) The KISS Theory: Salespeople by nature are like electricity. They naturally take the path of least resistance. That's not to say they are lazy or untoward. In fact, it's just the opposite. Good salespeople look to simplicity to make things happen. Often, incentive programs fail miserably because of innate complexities either in their recording and reporting systems or in how rewards are won. If you put the salesperson in a position where he or she is forced to assess "To get this, I first have to sell this, plus these and not these and they must include these," you are creating a recipe for confusion, sales frustration and failure. In the end, the incentive program becomes a disincentive! The remedy? Manufacturers must keep the incentive program sweet and simple and attainable. There can be no ambiguity. Anything less will result in a lack of interest, as well as a waste of time and money that can sometimes spill over into other departments whose task it is to administer and account. 4) Competition: Everyone's heard the expression, "Timing is Everything!" This is particularly important sage advice for the successful incentive program planner. Marketing execs. can't know when every competitive incentive program will rear its aggressive head, but they can take strides to ensure their program is given first look. diligence on the front end." Simply put, the better the preparation, the more likely the sale. The same can be said for incentive initiatives. Real incentive programs, like new movie releases, are something to be anticipated. The right amount of promotion ensures greater acceptance and interest that often usurps focus on competing programs. 5) Reward: Any reward-value can become an unmotivated, anticlimactic activity if the time span between winning and getting is too long. Successful incentive programs reward immediately! As a rule, the faster the reward is delivered, the greater the enthusiasm for the incentive program. Although on some levels, salespeople are a complex breed, when it comes to incentives, they are – for the most part – quite predictable. Their nature is to react to excitement or challenge faster then most, and then move on. One way to maximize their natural bent and ensure greater program success is simply to cater to their natural motivators. "Get them their stuff QUICKLY!" 6) Recognition: At the risk of making salespeople appear shallow or monolithic (they are not), recognition amongst their peers is still the quintessential motivator, whether there's an incentive program or not. The rule again, is, there is no such thing as TOO much recognition! Salespeople by nature gravitate to the limelight much like other performers, and so there should be no shortage of achievement and overachievement recognitions that find their way – in a timely manner – to the public's eye. Psychological studies have shown that the pursuit of recognition, in and of itself, can make the difference in targeting that critical second twenty percent on the sales achievement ladder. Experts agree that successful sales teams find motivation in their own champions. Beatifying the sales leaders instills excitement and a definable hierarchy that beckons all players to become a part. Another fact that is frequently overlooked is that recognition, whether part of an incentive or not, is the least expensive means of motivation. In many cases, it's free! Often, shaking the hand of the president in front of the company is all it takes to galvanize the need to overachieve. The Bottom Line: Manufacturers and Distributors must take greater care when designing motivational incentive programs. Take a page out of the "Sales 101" book that says, "Find out what they want, then, give it to them!" But make sure to keep it simple, keep it clear, promote it properly, reward immediately, don't try to target everybody, and, recognize, recognize… RECOGNIZE!